This recipe comes from Thai Cooking Made Easy — with this recipe, it lived up to its name. Cooked chicken is shredded and tossed with a bunch of veggies and a slightly spicy lime and fish sauce dressing. This would make a good starter to a larger meal. Yum, guy! I like this salad. It’s totally fine — once you toss it in and mix everything together it’s not nearly as intense. This salad makes me hungry. Not surprising… ain’t no carbs here! Promise me we’ll never do a low-carb diet. How about we just don’t do any kind of diet? Bring the water and salt to a boil in a saucepan over medium heat and poach the chicken for about 15 minutes or until cooked. Remove and set aside to cool. Shred the chicken into thin strips. Combine the Dressing ingredients in a bowl and mix well. In a large bowl, combine the chicken strips with the tomato, onion, cucumber, green onions, and cilantro. Pour the dressing over and toss thoroughly. Line a serving platter with the lettuce leaves and top with the salad. Serve immediately. Serves 4 as a starter or part of a larger meal. This entry was posted on Saturday, May 10th, 2008 at 10:33 am	and is filed under Salads and Light Soups, Thai, Thai Cooking Made Easy. You can follow any responses to this entry through the RSS 2.0 feed. You can leave a response, or trackback from your own site. 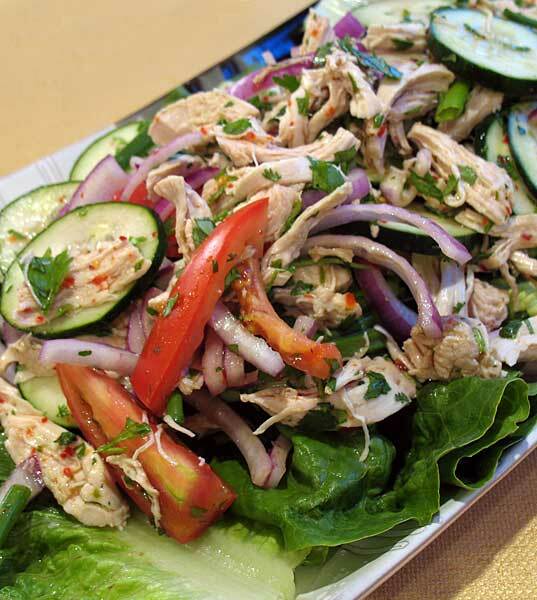 I think its a great combination that salad with chicken.Its looking gorgeous.I want to taste this soon. What a refreshing summer salad! Yum is right! this salad looks refreshing and delicious for summer.